The day's festivities were long and tiring. It may have been less tiring in cooler weather. It's nice to see friendly, familiar faces. I'm glad it's over. I need a shoe collective. Lately while tidying various areas of home and car I've been reminded of the fact that I have too many shoes that I bought for a specific or occasion, worn them once and never again. It displeases me. Not so much because I feel the money has been wasted (I refuse to pay much for these shoes), but because all of these one-time-use shoes are taking up space. 1. Refuse to succumb to social pressure that requires that shoes and outfit match in terms of color and formality. 2. Refuse to attend occasions where such matching shoes and outfit are required. 3. Find a shoe collective where I can rent shoes for specific occasion and return them immediately thereafter. 4. Be more willing to get rid of unused shoes, perhaps at Goodwill. Option #4 sounds the most promising at the moment. I finally washed my car today, after several months of neglecting to do so. The accumulation of filth upon my car had seemed gradual, but I think it had lately reached a level where the amount of additional dirtiness necessary for me to perceive that it was actually becoming more dirty was severe. I learned something about this fact of human perception, perhaps in my high school psychology class. When a stimulus is rather strong, the amount of increase necessary for humans to perceive the change becomes greater. I think the example I learned from back then was sugar in iced tea. If you have no sugar in the iced tea, after you add a heaping tablespoon you can notice the change. But once you've dumped half a cup of sugar into your iced tea, the addition of a tablespoon will not taste like much. Unfortunately I don't know what this phenomenon is called, so I cannot cite it here. So anyway, my car had reached a level of dirtiness that caused additional dirtiness to be imperceptible. I started to feel embarrassed about the uncleanliness of my car. And in a series of events over the last several days, which included 1) dreading that my mother would see my dirty car when my parents came to attend my thesis defense, 2) attending a friend's wedding at a fancy house in the hills and having to hand my car over to (and pick it up from) valet attendants, and 3) deciding to park around the corner from my parents' place, so as not to smear our mothers day visit with dirt from my car. So this morning I knew what had to be done. I pondered the manner in which I should wash my car. The first option was to wash it in our apartment's tiny parking lot -- once when I had talked to my neighbor about my dirty car with chagrin, he offered the hose he had for the water spout out back. Also I could take it to one of these hand car was places (although maybe they are a combination of machine and hand car wash) all over Los Angeles. But an investigative report that the Los Angeles Times printed a couple of months ago made me feel like these are shady operations. I didn't really want to get involved. Finally, I could take it to a coin-operated car wash and spraying it clean myself. 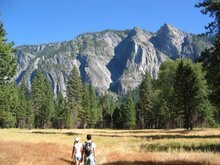 There are also quite a few of these places around L.A. And option #3 is what I chose. The coin-operated car was is a pretty good deal. It cost me $3, or 12 quarters, which is a pretty good deal considering that I spent $1 somewhat frivolously on 4 minutes of car VAC, not that there was so much dirt inside my car. So the wash itself was two bucks. The nozzle sprays different liquids. I used the spot free stuff (a foamy blue cleaner) and HIGH PRESSURE RINSE. The hose really sprays water out in a high pressure way. I felt as though, if bad guys approached or something, I could turn the hose on them and blast them into oblivion, or at least knock them onto their behinds. There wasn't a really good way to dry the car off afterwards. They didn't have any blow dry equipment as far as I could tell, though a couple people were using rags to wipe their cars down. All in all, the car is now clean and I am proud. Why didn't I think of doing this a long time ago? $2 coin-operated car wash. Small price to pay for a bit of self worth, confidence, pride. This morning while washing dishes (a fair number had accumulated as the result of general busyness of recent days) I was scrubbing a small glass bowl and I broke it with my bare hands. The bowl just cracked somewhat down the middle and left me holding two bowl halves of approximately the same size, one in each hand. I inspected the fault line to see whether I could assign fault to some original and inherent weakness in structure, but had no idea what I should look for with just my eyes. The last time I broke a dish, I think I had put down a glass too hard and caused it to crack. Because I like to read into things I decided that destruction of dinnerware means I need to be a more careful, sensitive, or gentle person. Though I'm not yet sure how to operationalize any of this. On my evening walk along Venice Blvd (always heading west, then coming back up east) I saw a bird fly by with a stick in its beak, as though it were collecting construction materials for its nest. I turned my head as it flew by, and my eyes followed it to a ledge above a convenience store. It landed and walked towards its nest, presumably to add the popsicle stick it had just procured from the streets of Los Angeles. 1. My car is so dirty that it's no longer recognizable as white, and I worry when I'm driving that I'll get pulled over for having illegally tinted windows. 2. My hair is longer than it has been any time in recent memory. I think I'm also losing my hair because it gets pulled off when I take out hairbands. A haircut would be a good thing. 3. My right contact lens is partially torn. Not a tear right down the center, but a tear in the corner, and I am out of replacements so I will keep wearing this one until I am bothered to make an eye appointment. My eye used to get irritated because of the tear, but I have been wearing my broken lens for months. 4. We haven't been to the gym in forever. That discounted corporate membership to Ballys, alas, going to waste. I feel myself getting increasingly soft and blob-like. 5. The pile of recycleables continues to accumulate, not just in the apartment (since we would be overwhelmed), but in our vehicles. The other night I dreamt of being buried alive in all of this recycleable trash. 6. We actually managed to run out of scratch paper. We figured it would never end, some six or nine months ago, which is why we were willing to recycle a whole bunch of it. Statements from our financial institutions that come in the mail have become fair game. 7. We had Hamburger Helper for dinner last night (not with real hamburger), which I am convinced was the cause of my evening-long gastrointestinal woes. Yes I did add spinach, and OK, it tasted pretty decent, but is stuff that come out of a box ever really food? Ok, so I was curious about it because I had never tried any and a friend was eating it. But that's besides the point. The point is that dissertation writing hasn't been all that bad (nobody died and no animals were harmed in the process), the whole experience is practically over, it's seriously an excuse that I use not to take care of random stuff that I've decided is not urgent. It will be great to take care of these silly, day-to-day, kinds of things once the dissertation is over and done. Kefir: yogurt for people who like liquids better. Due to my mixed feelings regarding Twilight, I wasn't sure if I wanted to forge ahead and read the second book in the series, New Moon. But I started reading, kept reading, and finished it last night. Yes, this after I stated that too much could rot your brain. All in all, I preferred this second book to the first one. Less swooning/obsession/fawning, more pain of love lost, and finally more action and backstory. The werewolves vs. vampires thing is an interesting layer to the story. I actually found myself tearing up, which made me feel a bit silly -- guess it was an emotional day. Apparently in the U.S. we have chimpanzee retirement communities. I just learned about this from the Human Resources episode (podcast) of Chicago Public Radio's This American Life (which I love). The episode aired a couple of months ago. I only listened to it now because I like to have a healthy backlog of podcasts so that I don't feel as though I'm in danger of running out. According to the episode, as well as this article from the NYTimes, we have an excess supply of chimps as a result of AIDS research in the 1980s. 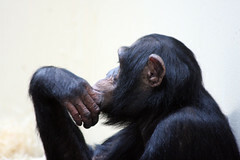 At the time it was believed that chimpanzees could be used for medical testing of the AIDS virus. Since researchers figured that testing on chimps might be able to procure a cure, many primates were bred for this purpose. Only, they weren't really useful at all, because they didn't really get sick from AIDS. There are also a bunch of chimps who have been actors in Hollywood. But they are only suitable actors for about 5 years, at which point they become too strong and rebellious to cooperate. So lots of chimps that are no longer useful. But unlike scenarios where we have too many rats, pigeons, or dogs, we don't put down chimps because we have decided that it is unethical. After all, they share a ridiculous (98%) of our genetic makeup. So in 2000, then-President Bill Clinton signed the Chimpanzee Health Improvent, Maintenance and Protection (CHIMP) Act, and now chimpanzees can spend the rest of their days in locales such as the Chimp Haven. As described in the podcast, chimpanzee retirement experiences range from wilderness preserve to extremely human. Cheeta, who acted in many Tarzan films, is over 75 and spends his days eating Doritos, tickling the ivories now and then, and watching his own films. Some former research subjects have one foot in each world, having to learn how to forage for food in a wilderness setting but also being fed three square meals a day and enjoying General Hospital now and then. 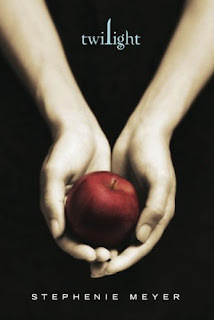 Yesterday I read Stephanie Meyer's Twilight. It's the first book in a series of books named, coincidentally, The Twilight Saga. I first learned about the book via YouTube vloggers, fiveawesomegirls, who seemed to be fans -- so much so that they traveled to the middle of nowhere, where most of the book takes place. Then a week or so ago, one of the Culver-Palms Youth mentioned having just read the first book and also liking it a lot. It's a Young Adult book, but I happily read through all the Harry Potter books last summer, and the Twilight books have really good review ratings on Amazon.com, so I figured I'd give Twilight a try. I have to say that I was disappointed. I suppose it's not a bad book, but a mediocre one. When I actually browsed through the reviews and read what readers had to say, a pattern seemed to emerge. A number of the reviews indicated disappointment with the book for its shallow characters and dialogue, melodramatic plot, and rather inane lessons for adolescent girls. In this first category, this one's my favorite. A number of comments leapt to the author's defense, mentioning how much they loved the book, how well they could relate to the characters, how it was the best book of all time. On the whole, it seems like this first group of reviews is written by adults. The second group of reviews, by teenagers (who often mentioned the fact that they are teenagers and could totally relate). There are about 1500 reviews right now, a lot of them which seemed to convey disappointment but the vast majority of which gave the book 5 stars. I'll give the book some credit for knowing its audience, and recognize that even I like to eat candy sometimes. I mean, for all of my complaining to Alex throughout, I did keep reading. Is it appropriate to call them checkers? Checkout person? I started shopping at Vons (associated with Safeway and Pavilions) when I moved to Palms at the beginning of grad school. I noticed that, unlike at Ralphs, where I'd grown accustomed to shopping in college, at the end of VONS transactions, they thank you and wish you a good day, referring to you by name (or the name printed on your receipt). Employees in the store, whether reshelving, stocking produce, or some other activity, always ask how you are doing and whether you're finding everything okay. And this is all good. But one supermarket checkout clerk goes above and beyond the call of awesome. She appears to be middle-aged, and her English carries a heavy Cantonese accent. I first made mental note of her when she refused to sell me grapes. She refused to sell me the grapes because I had picked up green grapes, which were not on sale. They were something like 3.99/lb, unlike the red grapes, which were .99/lb. that week. She told me she could just keep my stuff there, and I could put back the grapes I had picked up, and get the correct grapes, come back, and finish being checked out. Not being particularly wed to the green grapes, I complied. Pretty cool, I thought. She is also unwilling to let customers miss out on VONS Club savings. If a customer comes through the line without his card and could potentially miss out on VONS Club savings, the checker lady will ask other customers in line whether or not they will lend the fellow a swipe of their card. My most recent visit to VONS included such an experience, and I happily let the other customer take advantage of my VONS Club savings. The supermarket checkout lady pointed to the two cartons of ice cream among my grocery selections and noted that they were Buy One, Get One Free that week. Remembering the incident with the grapes, I asked whether she memorized all the week's grocery deals. She said she HAD, and that before coming to work each Wednesday (the day that the grocery stores' weekly specials kick in), she goes through all of the grocery store flyers for the local chains. "Yes!" she said. And proceeded to tell me that chicken was on sale at Ralph's this week, telling me how much per pound of what. I am humbled by her dedication to her work.